Have a wonderful, grand space that needs lots of cover? We can provide this with the new, dramatic, ample sized Jamaica Patio Umbrella! The Jamaica is a fantastic octagonal jumbo patio umbrella which enables you to enjoy the summer under this gorgeous large patio piece with classic design lines. The monumental 12 foot diameter canopy makes for a great statement piece to cater to your patio, poolside, veranda or out in a field! You choose! 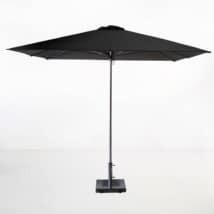 Included in the price is the Jamaica Slab Umbrella Base, as shown. Canopy 12' diam., Height 10.9', Mast 2.5" diam. Canopy 3.6m diam., Height 3.3m., Mast 6cm diam. The epically proportioned Jamaica Umbrella is a terrific choice for commercial as well as residential properties. Try it in the courtyard of your restaurant, sheltering up to 5 tables from the harsh sun rays. Pair up the Jamaica Umbrella with 5 of our 35” Round Pedestal Tables with Tango Stacking Chairs for a substantial, modern and welcoming set up for your guests to dine in. Perhaps your patio needs cover for deep seating and a dining table? Place the Jamaica Patio Umbrella in Taupe in the center of your space, place your 78” Raw Dining Table on one side, surrounded by Cannes Director Chairs in Taupe, and a Monterey Loveseat on the other with a couple of Club Chairs with Taupe Cushions and you are set for a superb, elegant and comfortable setup for your dining and reclining! 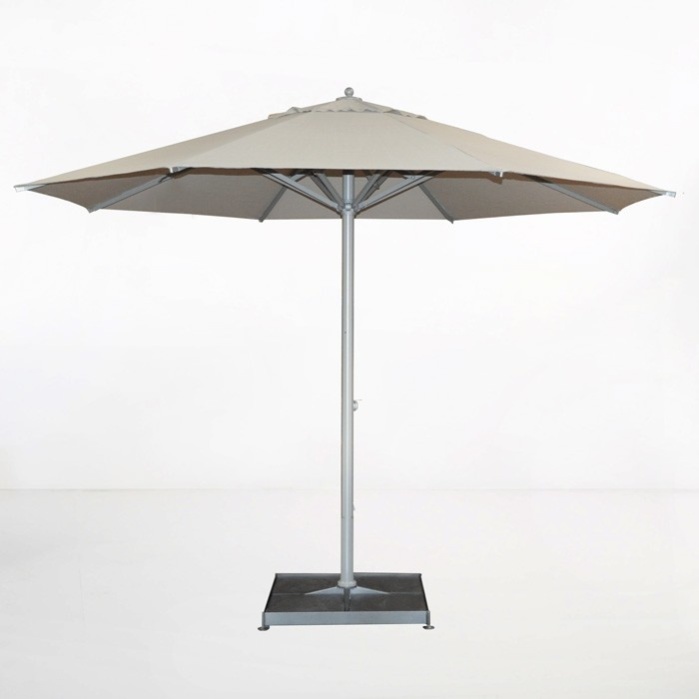 This jumbo patio umbrella features a Sunbrella® canopy – available in Taupe or White – with a thick, sturdy aluminum frame. Measurements are 12ft diameter and a 2.5″ diameter pole. 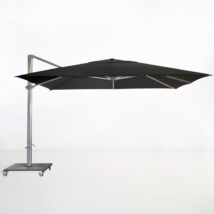 The closing mechanism is a beveled pole, on closing the umbrella the pole elevates to an overall height of 131″. Price includes the Jamaica Slab Base made of 4 sections with stone inserts. The Jamaica Patio Umbrella is in stock now, ready to ship to your door!